No time for a full workout? 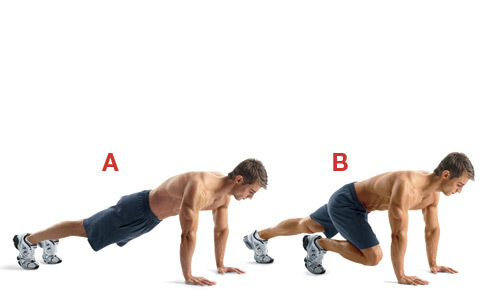 Well, you probably can fit in this 4-minute Tabata workout ! This form of High-Intensity Interval Training burns up to 15 calories per minute, meaning just a short workout will leave you sweaty, full of energy, and ready to take on your busy day. Do each set with as many reps as you can do in 20 seconds,then rest for 10 seconds. One cycle lasts 4 minutes. After each cycle, rest for 30 seconds. 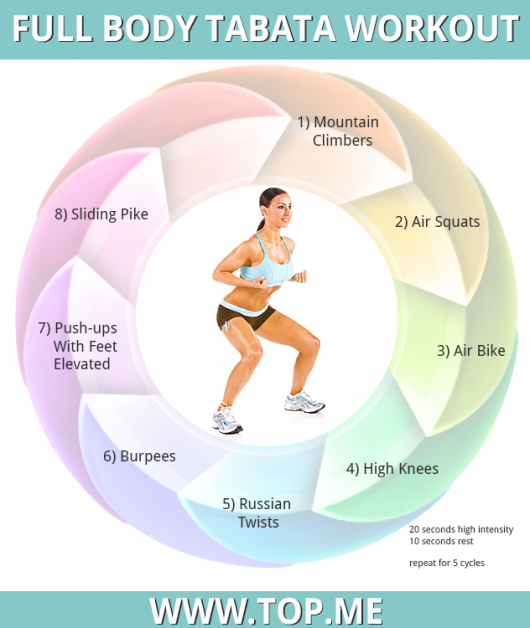 For extra benefits, repeat the tabata workout for 5 cycles – you will have done a complete workout in just 20 minutes total! Heels under hips, toes slightly out. Move your hips back and down. Squat down until hip crease is below knee crease. Return to standing with your hips fully extended. Lie down facing up, and bend your knees so your feet are flat on the ground. Keep your back straight and shoulders back and bring your upper body up until you can see over your knees. Put your hands behind your head and elbows out. Bring your right knee closer to your chest reach your left elbow to your knee, alternating quickly. Lightly jog with high knees. Advanced variation: hold a weight with both arms for resistance. Lie on the floor face down and place your hands about 36 inches apart from each other holding your torso up at arms length. Place your toes on top of a flat bench. This will allow your body to be elevated. Note:The higher the elevation of the flat bench, the higher the resistance of the exercise is. Using your pectoral muscles, press your upper body back up to the starting position and squeeze your chest. Breathe out as you perform this step. Advanced variation: use an exercise ball to elevate your body instead of a flat bench. This adds a level of difficulty due to the instability provided. Facing down, get into a full push up position, making sure to keep your back in line with your legs and keeping your arms extended and firm. Starting with your feet together, one on top of each towel. Slide your feet apart until you come into a challenging V-position and slide them back together.